Putting an end to murmurs around his political ambitions, Mollywood superstar Mohanlal said that 'politics is not my cup of tea'. 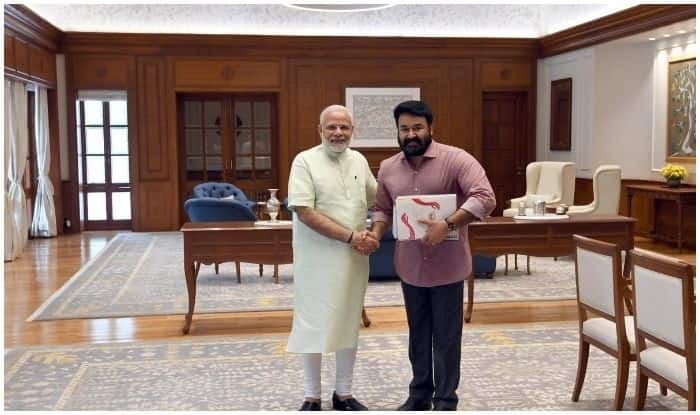 Malayalam superstar Mohanlal meets Prime Minister Narendra Modi. New Delhi: Malayalam superstar Mohanlal has put an end to rumours surrounding his entry into politics and avowed that he will not be contesting the upcoming Lok Sabha election. Mohanlal’s statement comes close to the comments made by the BJP Kerala state unit general secretary TM Ramesh, who declared that the party was willing to give the Mollywood star a ticket of his choice. In addition, it was reported that BJP MLA O Rajagopal also confirmed the party’s readiness and told media that ‘they are pursuing the actor to contest from the Thiruvananthapuram constituency’. Mohanlal’s comments gain relevance at a time when several actors are jumping the Neta-wagon. A few days ago, Bollywood actress Isha Koppikar joined the Bhartiya Janata Party (BJP) in Mumbai- where she was appointed as the working president of Women Transport Wing of BJP. On January 2, veteran actress Moushumi Chatterjee also joined the BJP in the presence of party leaders Mukul Roy and Kailash Vijayvargiya. As per reports, Chatterjee is likely to contest the upcoming Lok Sabha Elections. Mohanlal (58) who is also the president of the Association of Malayalam Movie Actors (AMMA) is currently working on Priyadarshan’s Marakkar- Arabikadalinte Simham.